E-Prime 3.0 introduced the ability to choose the underlying Sound API used during an experiment session. The sound API that is used with the sound device can be modified by editing the SoundDevice object. To do so, select the Experiment Object properties, select the Devices tab and then double-click on the SoundDevice object. Click on the API dropdown list and select the desired API. 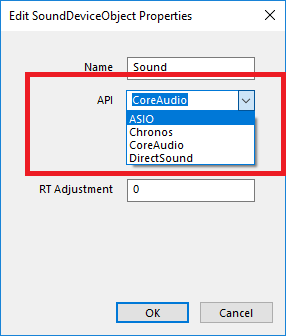 NOTE: Use of DirectSound for machines running Windows Vista, Window 7 (or later) is not recommended for paradigms that require sound latencies under 30ms.